I didn't plan this third entry when I did the earlier two "Toys Of The Wrist" entries but my watch (above) died a couple of days ago. I bought this watch back in 2000 when I started dealing with clients in the US. I needed a watch to keep track of my west coast clients. My job required me to be in constant communication with them and as such I need to know when they are awake and when they are not. Signs of trouble started a month ago when the batteries died. It got me by surprise considering I just changed them back in November last year, when I was in the Capital. The batteries didn't even last a year? That can't be right!? Initially, I thought I got fitted with bad batteries from the unscrupulous watch shop as it is pretty common for a foreigner to get cheated by the locals (well, not ALL of them, but quite a few). I remembered paying a lot of money to change the batteries back then (didn't have a choice). So a month later, my watch stopped again. Then it dawned on me that it is the watch going wonky and not the batteries after all. As it was a cheap watch which I bought at Great World City for a mere SGD 110.00, it wasn't worth the time, money nor effort to repair the 13-year old watch. 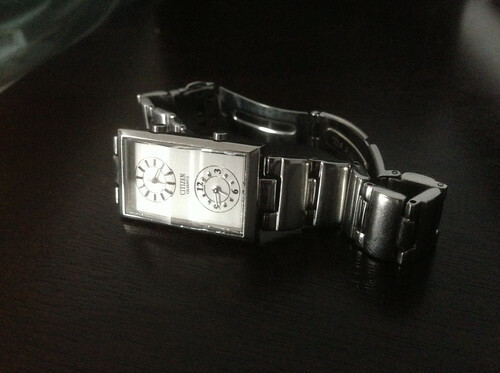 So thank you for the 13 years of faithful service, my dear Citizen watch. I look forward to my Hot Watch, due to arrive around Christmas this year, if it shows up at all. so in the mean time, how u jaga both time zones? Cow & Aloe: First of all, I don't really monitor Pacific Standard Time as much as I did in the past. These days, our smartphones has world clock function which allows us to track the time over several timezones. To go one step further, I just ask Siri to tell me the time in Los Angeles (for example) and it's as simple as that.